Proper Carb Size Selection. The most common mistake in carburetor selection is misapplication. First and foremost you must be realistic in what the capabilities of your engine and drive train are. Then, how will the vehicle be used? On the track or on the street? We all want the best of both worlds. But there are some factors to take into consideration in this area, Proper Carb Size Selection. Track cars are not going around the corner to get some ice cream or going to the movies on Friday night, therefore there is driveabilty issues that arise with “part throttle” driving in a race car. And,the street car, in most cases, is not turning 8000 rpm between stop signs. Therefore care must be taken in Proper Carb Size Selection for optimal performance in your vehicle. Typically for the size selection you need to know approx. horsepower (be honest). 600 cfm carbs best suited for low 300hp, 650cfm 340hp-390hp, 750cfm 400hp-460hp, 950cfm 490hp-575hp 1000cfm 575-595, 1050cfm-1250 600hp and up. Now comes whether or not you will require a mechanical secondary, or a vacuum secondary carburetor. Vehicles with quicker acting rear end gears (3.55’s 4.10’s etc) and standard transmissions respond best with mechanical secondary carbs. Vehicles with lower gears and auto transmissions in a heavy vehicle/truck work better with vacuum secondary carburetors. This is all based on the airspeed that the motor can generate. Consult with one of our carb technicians to get the proper advice before you spend your hard earned money on getting the most “affordable” carb you can find and not necessarily the right one. 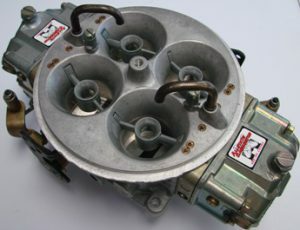 This is just a guide and other variables affect certain aspects of carburetor selection and modification to better suit the engines air/fuel requirements.